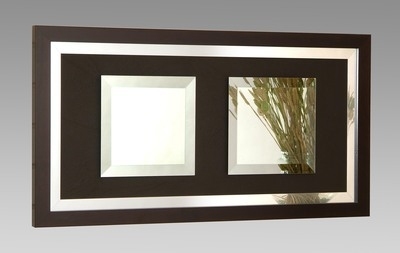 Icon twin mirror, with two bevelled mirror panels and a leatherette backing, in a silver & dark wood effect frame. Overall size.94X43cm. Two bevelled mirror panels with a leatherette backing, with a dark wood & silver effect frame. Choice of leatherette backing black or brown.